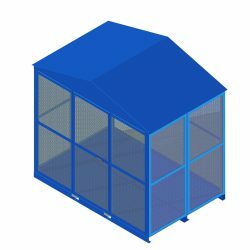 The Cylinder Storehouse (CSH) is a heavy-duty formed and welded frame providing rigid and secure storage for industrial cylinders or any other valuable items. This cylinder locker provides visibility of contents, allows free air flow to combat leak hazards, and also protects gas cylinders from tampering. The CSH is modular and can be expanded as an operation grows or evolves. Fork pockets make it easy to place units on-site. The pitched roof minimizes exposure to the elements, and the door can be padlocked to prevent unauthorized access. A strike protector defends the padlock, and the door hinges are welded for strength. Because industrial compressed gas cylinders have the potential to explode, fall with crushing force, or even blast across a room, strict protocols must be followed when storing or transporting them. The BHS Cylinder Storehouse was designed to minimize the risks associated with compressed gas cylinders. Compressed gas cylinder storage should be weatherproof and well-ventilated whether they’re in a warehouse or on a work site. Our cylinder storehouse achieves these two contrasting goals by employing formed steel for proper ventilation and a pitched roof to drain away rain and other moisture. BHS Cylinder Storehouses guard compressed gas cylinders from the elements and from dangerous buildups of leaked gas. Add a padlock to prevent unauthorized access, and your cylinders will be fully secure. Protect your staff and equipment while remaining efficient and productive with expandable BHS Cylinder Storehouses. Contact our sales team at 1.800.BHS.9500 to learn more about the Cylinder Storehouse and other Cylinder Storage and Transport Equipment.